If you want to become a Racehorse Trainer, you must be 21 years of age or older and should have a minimum of 2 years’ experience working in a Trainers Yard. Alternatively, if you held a rider’s licence with an acceptable number of rides for the same period or were registered as a Point to Point Handler with an acceptable number of runners, you may also be eligible to apply. Any Applicant which does not meet these criteria should discuss their experience with the Irish Horseracing Regulatory Board (IHRB) Head of Licensing. Applicants must successfully complete a Portfolio in advance of being accepted for a Practical / Written Assessment. The assessment consists of a Written Exam, Horse Handling and Practical Skills and Horse Knowledge – Oral. A pass mark of 60% must be attained in order for the applicant to qualify to complete the Trainer’s Course. The course is held over 9 days i.e. 3 days per week over a three-week period. Following the completion of the course, a stable inspection will be carried out on your proposed training establishment and a report compiled which will be forwarded together with your application and all relevant documentation to the Licensing Committee, at which stage you will be informed of a date and time to attend for interview. The Licensing Committee will ultimately decide on whether a licence is granted. The completion of a Portfolio, Practical Assessment and Course does NOT guarantee the issuing of a licence. If your licence application is refused by the Licensing Committee, you have a right of appeal to the Appeals Body. If you have any questions on how to apply for a licence or the licensing process, you can contact the Licensing Department of the IHRB by email: licensing@ihrb.ie or telephone 045-445605. For further information, please download the application form from our website. Applications and portfolios for this course will be accepted on a first come first served basis and must be lodged with the Licensing Department before Friday, 22nd March, 2019. The maximum number on the course will be 16. NB: a minimum of 10 applications is required in order to proceed with this course. Participation in this course does NOT guarantee a licence. Application Forms and Syllabi are available from the Licensing Department, The Irish Horseracing Regulatory Board, The Curragh, Co. Kildare. Tel. 045 – 44 56 05 or may be downloaded from our website at www.ihrb.ie. Completed forms and fees must be returned as soon as possible. Trainers and all Licensees are reminded that they have an obligation to familiarise themselves with the Rules of Racing and all relevant policies and procedures and to update themselves on a regular basis. Ignorance of the rules is not a defence to non-compliance. To assist Trainers, we have created the below document for reference and included specific rules however please be aware that this is not an exhaustive list of rules and Trainers must ensure that they are fully aware of all their obligations and responsibilities. All amendments to the Rules of Racing are published in the Irish Racing Calendar and on the website of the IHRB. Regulation 1, Rule 145, 146. Licences for members of the Turf Club. Work Riders who have suffered a concussion. Rule 194 and Regulation 16. Declared in Error – 2 days & mandatory €200 fine for first offence. Not less that €320 for subsequent offences within the calendar year. Suspensions commence the day following the race meeting. In the case of a horse being withdrawn due to being ‘In Season’ and when declarations close two or more days in advance of the meeting, then the suspension shall be 3 days commencing on the day following the race meeting. Rule 256, 257, 258, 259, 260, 262, 262. Obligation on Trainer to ensure that their horse runs on its merits. Obligation on Trainer to ensure a horse is not in a condition which may preclude it from winning or obtaining its best possible placing. Powers of the Stewards and Senior Racing Officials to consider evidence in relation to the running and riding of a horse. Requirement to report anything that may have affected a horse’s performance. Rule 271, 272, 273, 274, 275, 276. Participation at unrecognised race meeting. Requirement on Trainers to return documentation detailing the amount payable to each employee. Requirement on Trainer to display the Trainer / Employee agreement in a staff working area. Handicappers discretion not to handicap a horse despite having run three times. A rider must be nominated for each declared horse in every race by 12 noon on the day fixed for declaration of horses in the programme of the meeting. 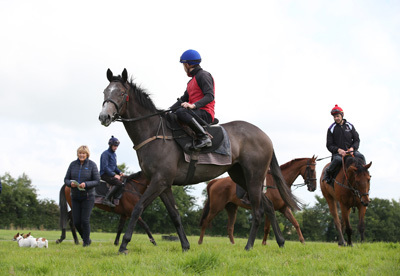 It is the responsibility of the Trainer to ensure a Rider is nominated to Horse Racing Ireland by that time. If the rider expects to carry overweight of up to 2lbs, that probable amount shall be declared to Horse Racing Ireland by this time also. The responsibility for such declaration rests with both the trainer and the rider. It is the trainer’s responsibility to establish a rider’s availability to ride in the race before the rider is declared. If there is no rider nominated on a horse by 12 noon on the day fixed for declaration, then a rider must be nominated in writing to the Clerk of the Scales or to the Non-Runner Line not less than one and a half hours before the time fixed for the running of the first race on the day of the race, otherwise the horse will be withdrawn. The trainer will be required to give an explanation to the Acting Stewards, and a fine may be imposed. In the event of a horse being unable to fulfil its engagement on any Raceday (including any horse listed as a reserve) notification must be made by telephone to the I.H.R.B. on 045-445645 not less than one and a half hours before the time fixed for the running of the first race. In the case of a horse listed as a Reserve and where a trainer exercises the option to run, a declaration to run (including the name of the rider nominated) must be made by telephone to the I.H.R.B. on 045-445645 not less than one and a half hours before the time fixed for the running of the first race. Trainers must ensure that the rider is qualified to ride in the race. If the rider that is being nominated on the reserve expects to carry overweight of up to 2lb, that probable amount should be declared at this stage also. A horse may be suspended from running for up to 90 days if it performs or behaves below a level which is deemed unacceptable by the Acting Stewards. (See Rule 212C (d). These reports must be made as soon as possible after a race by either the Trainer, Trainers Authorised Representative, the Rider or the Owner. Examples of such reports would be :- "Hanging in running", "Made a noise in running", "Lame", "In Season", "didn't handle the ground", " exercise induced pulmonary haemorrhage". Under Rule 194(iii) if a horse fails to fulfil its engagement, suspensions may be imposed on the horse withdrawn depending on the reason for the withdrawal and whether or not the reason given is accepted by the Stewards. The minimum suspension periods which apply are set out in Rules 194 (v) & (vii). If the reason for the withdrawal of a horse is not accepted by the Stewards additional fines may also be imposed. If a horse is withdrawn less than one and a half hours prior to the time fixed for the first race a fine of at least €200 for the first offence in a calendar year shall be imposed, unless the Stewards are satisfied that the reason for not running is a valid one. Fines may increase for subsequent ‘late withdrawals’ within a calendar year. Any withdrawal under Rule 194(v) (c) (In Season) or (d) (Illness, Stress, Injury) requires the lodgement of a veterinary certificate within 3 days. Failure to lodge the veterinary certificate shall result in a fine of €200 in the first instance being imposed as per Rules 194(v) & (vi). It is the responsibility of the Trainer to that ensure that horses are withdrawn by the deadlines and to confirm if the reason submitted was accepted by the Acting Stewards. Ensure that the passport has been endorsed by the current trainer – this means that the trainer or their representative has checked that the markings and microchip recorded in the passport are correct and fully match the horse in their care. This is particularly important when a horse has been ‘marked up’ as a foal – changes can often occur between that time and when they start to race. Ensure that Section IX is completed if the horse has received medicines such as phenylbutazone which otherwise need to be recorded in the passport. The I.H.R.B do not require that Section IX is completed but we wish to make trainers aware of the consequences of it. Copies of a passport may be accepted under exceptional circumstances, for example if the passport is being held by Weatherbys or HRI for a particular reason and the horse is to run but the expectation under such circumstances is that contact will be made ahead of time to the I.H.R.B to advise of such a circumstance. Copies of a passport will not be accepted if the horse is running under the circumstances set out in Rule 90 (i) – i.e. first time running in Ireland etc. Under Rule 256 of the Rules of Racing a decision of the Stewards on race day may be appealed by an Owner, Trainer or Rider of any horse running in the race or any person who has been subject of a decision. Notice of Appeal should be addressed to the I.H.R.B and emailed to info@ihrb.ie. This appeal will be a full re-hearing of the matter and the decision of the Appeals Body will be final. The Appeals Body can confirm the original decision, vary the decision including the sanction or reverse it. Any variation of the sanction may include an increase of a penalty but only within the limits imposed under Rule 14. If the 48 hours expires on a weekend day or Bank Holiday, the deadline will extend to the first business day the office is open for business. Appeals Body can determine the appeal on the basis of a transcript of the original hearing as certified by the Chairperson. Appeals Body may require a hearing of an appeal if they deem it necessary or on application of any party. Person making the appeal can express a view as to which Division of the Appeals Body should hear the appeal under Rule 19C(6) however this is not determinative. Any person appearing before the Licensing Committee, Referrals Committee or Appeals Body is entitled to have their case presented by a legal representative or by a designated official of a recognised Association under Rule 259. What should I do before I run a horse outside of Ireland and Great Britain? When a horse is to travel outside of Ireland for the purpose of running in a race the trainer must inform Horse Racing Ireland no later than the day prior to the deadline for declarations of the name of the country where the horse is to travel together with the name of the horse and the race name and date of the first race in which the horse is to run. Horse Racing Ireland will then submit a Racing Clearance Notification (RCN) to the recognised Turf Authority staging the race. The above requirement does not apply to horses travelling to Great Britain to race. The RCN will attest that a) the horse is free or not free as the case may be from any restrictions preventing it from racing, b) that the Trainer is duly licensed and c) that the Owner is duly registered and does not appear on the Forfeit List. For the purposes of the RCN a restriction on a horse does not include incomplete records of vaccination. The Racing Clearance Notification does not state that the vaccinations are in order, so it is important to check that the vaccinations are up to date in the passport before travelling. All declaration of runners must be made directly to the racing authority of the country where the race is run, and trainers should be aware of possible time differences. Some countries do not use this clearance method and in which case the trainer should check with HRI for the procedure to be followed. What should I do when the horse has run outside of Ireland? When a trainer runs a horse anywhere outside of Ireland he/she must notify Horse Racing Ireland within 48 hours of the race being run or before the horse is entered in another race in Ireland (whichever is the earlier) of the details of the racecourse performance. Failure to do this will result in a fine. When a horse travels outside of the country to run in a race there will be an identity check on the horse the next time it runs in Ireland. Failure to produce the passport then will result in the horse not being allowed to run and a fine being imposed. 1. All horses that run in a claiming race may be claimed by any person, subject to these Regulations. 2. The claiming price for every horse shall be declared to Horse Racing Ireland by the time of closing of entries and this price may not be changed. If no claiming price is declared, then the top claiming price shall be taken as the advertised claiming price. The claiming price will be printed on the race card. 3. The weight to be carried by a horse entered for a Claiming Race is linked to the price at which he may be claimed. The price/weight relationship is set out in the conditions of the Race as published in the Irish Racing Calendar and printed on the race card. 4. A horse which is the subject of a registered Lease may not be entered or run in a Claiming Race without the written consent of the lessor. 5. Any person disputing the ownership of a horse listed to run in a Claiming Race must notify Horse Racing Ireland of the nature of the dispute at least twenty-four hours before the advertised starting time of the race. In such a case the Directors of the Irish Horseracing Regulatory Board, may at their absolute discretion, decide whether the horse shall be allowed to run in the said race. 6. Any horse declared for a Claiming Race must be available for inspection at its training stables at any reasonable time prior to the race. During this time the Passport should be available for inspection. When a filly or mare has been declared to run in a Claiming Race it shall be the responsibility of the Trainer to inform Horse Racing Ireland by the time fixed for closing of declarations if she has been covered by a stallion in the previous twenty-one days and whether or not she has been confirmed in foal and such information will be published on the I.H.R.B website (www.ihrb.ie) and the HRI RAS website (http://www.hri-ras.ie/) prior to the race. 7. A horse may not be claimed for less than or more than the advertised claiming price. 8. Duplicate claims (submitting more than one claim for the same horse by the same person including through any form of collusion with any other person are not allowed. 9. Claims may only be made by telephone to Horse Racing Ireland on the following designated telephone number - 045 455444. 10. Claims received by telephone shall be accepted from Horse Racing Ireland account holders (other than a rider riding in the claiming race), subject to that person being authorised by Horse Racing Ireland to make a claim. Claims made by persons not holding a HRI account shall only be accepted if payment is authorised by Credit or Debit Card. 11. The telephone claiming system will be operational every time there is a Claiming Race and the dedicated telephone number shall be the only valid number for receipt of claims. Claims may be made by telephone from one hour prior to the advertised starting time of the race until 10 minutes after the "Winner All Right" announcement has been authorised. Sufficient details must be given at the time to identify the person making the claim. 12. The claimant shall provide the name of the horse which is the subject of the claim, the name of the designated Trainer of the horse, should the claim be successful and any further information which may be required from time to time by Horse Racing Ireland. 13. Horse Racing Ireland shall inform The I.H.R.B Security/Investigations Officer, or his designated deputy of all claims made not more than 15 minutes after the "Winner All Right" announcement has been authorised. 15. The successful claimant(s) shall then be determined by the I.H.R.B Security/Investigations Officer or his designated deputy in the presence of one or more of the Stewards, subject to paragraph 16 of this Regulation. 16. Should there be more than one claim for the same horse with the same pre-designated Trainer the I.H.R.B Security/Investigations Officer or his designated deputy shall initially reduce by lot, in the presence of one or more of the Stewards, the number of such claims to one claim for that trainer. Thereafter if there is more than one claim for the same horse the successful claimant will be determined by lot in the presence of one or more of the Stewards. The identity of any claimant will not be disclosed until after the time for making claims has elapsed. 17. The claiming price shall be debited to the successful claimant's Horse Racing Ireland Account or credit/debit card. 18. Title to the claimed horse shall be vested immediately in the successful claimant and the claimant then becomes the legal owner of the horse regardless of the result of any test that may have been taken in accordance with Rule 18 or the physical condition of the horse. 19. Any objection lodged against any horse subsequent to the race being run will have no effect on any claim made. 20. Arrears due as a consequence of a successful claim shall be subject to Rule 165. 21. The advertised claiming price of a horse successfully claimed shall be subject to a 5% payment by the original Owner(s) of the horse to Horse Racing Ireland and The Governing Bodies. 22. When a claim is successful Horse Racing Ireland shall immediately inform the claimant. It is then the claimant's responsibility to contact the Racecourse Executive, without delay, to confirm travel arrangements for the claimed horse. 23. After unsaddling, all horses that have run in a Claiming Race shall be taken straight to the racecourse stables and may not be removed from there without clearance from the I.H.R.B Veterinary Officer or the Veterinary Assistant. 24. The prize money for a Claiming Race is for the benefit of the Owner(s) of the horse recorded with Horse Racing Ireland at the time of running. A horse's eligibility for claiming is not affected by his "walking over". 25. In the event of a claimed horse holding any subsequent engagements, such engagements shall pass to and become the liability of the successful claimant. 26. A horse successfully claimed by any person will automatically be returned out of training. c. since that day the horse was claimed from another claiming race or was sold at public auction. 27. Within the period of three months following the day of the claiming race should a successfully claimed horse be next returned in training by a Trainer other than the named pre-designated Trainer, the matter may be referred for investigation to a Senior Racing Official. 28. It shall be a breach of these Regulations for any person to attempt to prevent another individual from claiming a horse or for any person to refuse to release a claimed horse to the successful claimant. 29. A list of all claims received, and the successful claimant will be published on the I.H.R.B website (www.ihrb.ie) and the HRI RAS website (http://www.hri-ras.ie/) not later than the next working day following the race. 30. In the event of a Claiming Race being declared void by the Stewards, any claims in such race will be annulled. 31. Any person who commits a breach of this Regulation shall be reported to the Stewards or the Referrals Committee who shall deal with the matter using their general powers, which may include the annulling of any claim(s) on a horse. To obtain a Racing Establishment Employee Card, the trainer must apply for this card on the appropriate form within 5 days of commencement of employment. Applicants must be 14 years of age to obtain a ‘B’ card (part – time) which is determined by the number of hours employed weekly (0-8 hrs) or 15 years of age to obtain an ‘A’ card (full – time) (8-39 hrs). The Stable Employee Bonus Scheme came into effect on 1st May 2000 and is paid out quarterly to Trainers. The Scheme is financed by a 3% deduction from all prizemoney and that money is distributed to all registered employees who are in employment at the end of the relevant quarter. The amount paid to each employee is agreed by all employees and is based on a written Agreement signed by all employees and lodged with the I.H.R.B.